Get past the retch-provoking slimy goo horror and you'll find each snot blow contains a large amount of biologically relevant information about a whale. The effects of climate change haven’t spared a single species on Earth, affecting everyone from the gigantic blue whales in the pelagic to the minuscule bacteria in the soil. To protect these species and to be able to sense impending danger, it is important that scientists monitor the health of their populations. And they have done so using a variety of techniques and technologies, all the way up to using machine-learning to simulate their evolution. However, the investigations aren’t always so Daedalean; a curious case in point is that of the humpback whales. What’s whale blow, you ask? Well, it’s snot. Snot is as pathologically useful as it is disgusting. Get past the retch-provoking slimy goo horror and you’ll find each snot blow contains a large amount of biologically relevant information. Scientists can figure out a lot about an individual’s health by analysing the bacterial and viral makeup in its snot, and it’s a useful way to track the health of whales in time. That said, the tricky part is collecting whale not. Surely swimming up to a group of humpbacks, petri dish in hand, can’t be the best way to collect this precious substance. In 2010, a group of researchers in the UK suggested that remote controlled helicopters – i.e. drones – could be used to collect whale snot. The idea was ludicrous and the researchers were awarded an Ig Nobel Prize that year for their ‘improbable’ experimental work. And unlike many other Ig Nobel worthy ideas that “make you laugh, and then think”, theirs had some serious issues. For example, the snot samples could easily be contaminated or lost during the drop-off. 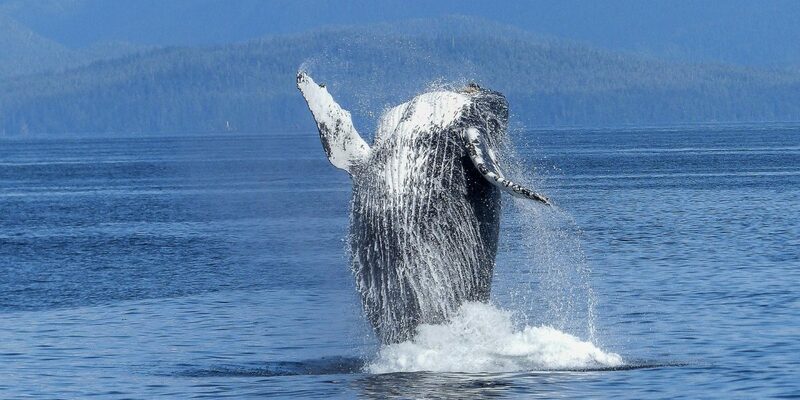 The team of researchers scanned an area off the coast of New South Wales for a migrating population of humpback whales. After identifying some individuals, they launched their drone a research vessel stationed nearby. The drone lifted off in accordance with the whales’ breathing rhythms. As soon as an identified individual surfaced and released its blow, the flip lid system built into the drone exposed the petri dish for sampling and closed it once it had its quarry. This nifty mechanism reduced the time for which the dish was exposed to the environment by a significant amount, allowing the researchers to collect snot from different whales in a population at different times with minimal contamination. Back in the lab, scientists set to work uncovering the bacteria and viruses that lived in the snot (the first time such information has been obtained with the help of a UAV). When compared to previously known baseline values for whales, this microbiome and virome data can provide a sense of the health of the whales in a population, trackable over time. By recording bacterial and viral density and correlating it to health, scientists can also design early warning systems to sound an alarm if such populations are on the verge of collapse. Studies like these are proof of how UAVs have revolutionised animal behaviour studies. Scientists often yearn for such non-invasive methods because they carry fewer liabilities vis-a-vis inducing physical or psychological changes in the population being studied. Older methods like using a pole to manually collect blow from whales could cause distress or induce chemical responses in an individual and potentially compromise an experiment. The health of large aquatic mammals clusters also provides key indicators of ocean health. Pirotta told the British Council, “The more we sample from whales, the better picture we build to learn more about their health. At the same time, we are also learning more about ocean health by sampling microbes living in our marine environment.” For example, she added, the whales they were studying off of New South Wales might have been ferrying microbes from Antarctica to Australia. While anthropogenic global warming, and the consequent human-driven sixth mass extinction, should be reason enough to care about these animals, bacteria piggybacking on migrating whales spotlights a stronger reason for those who want one: human health. Specifically, could humans contract a zoonotic disease via a virus hosted by a whale? “Yes, totally,” Sutaria said. The information contained in whale blow goes beyond giving us a handle on protecting whales, and actually offers a glimpse of the health and functioning of a living biosphere around these mammals. “If whale health or other large mammal health is going downhill, so are all the other health systems that depend on terrestrial and aquatic biomass,” Sutaria said. Ronak Gupta recently completed his masters in fluid mechanics from the Jawaharlal Nehru Centre for Advanced Scientific Research, Bangalore. He writes about all things science.